In a weird story of religious based censorship, a local newspaper blurred the faces of little girls that appeared in a toy store ad, without telling the store, drawing the ire of both customers and the chain. It seemed that this newspaper, which should be somewhat neutral in the process, angered everybody, and now the toy store Red Pirate is paying the price for it. This is a report of the recent events in Beit Shemesh. 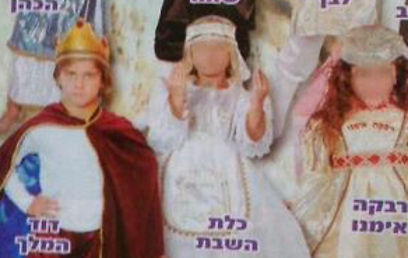 It all started with innocent sounding ads, where boys and girls modeled some Purim costumes for a series of ads. These ads were then sent to Haredim papers, and that’s where the trouble began. According to the store, the newspaper board of editors took the decision to blur the girls faces, while the boys stayed fully exposed, without ever telling them about it. The firs to find out were those who read the paper and were shocked to see the advertisement. It didn’t take for many people in Beit Shemesh, where the papers are produced, to flock to the Red Pirate Facebook page and complain. One writes “I am a woman with a face, now I’ll know not to buy from your store!” Another asks “How disgusting.. Do you also spit on little girls?” The Facebook page in question was still growing daily with disappointed girls posting their thoughts. Red Pirate meanwhile has to deal with the angry customers, while it claims it actually knew nothing of the situation. In a press release, the chain says that the newspaper took the decision and did not tell them about it. Meanwhile, the ultra-orthodox paper responds “Haredim won’t have an unclean paper enter their home.” indicating that it was done purposely. The protest meanwhile grew to impressive proportions in the community, and has no sign of stopping. It remains to be seen whether the paper will change it’s views or not on the issue, and whether the store will try to get financial reparation from Haredim. These types of cases often end up in court, as the store will no doubt suffer from loss sales because of this. Historically, there’s been many such calls for action from protest groups, and the stores affected usually see drops in sales. This isn’t the first time religious based decisions lead to anger, and likely won’t be the last. Many religious texts prone things that have become known as unjust in modern civilizations, such as inequalities between men and women, or archaic practices. Often however, these religions change much slower than many would like to. One thing is certain, this event is more than likely not over, and we’ll see how each party handles this issue in the future.